Ranking in the top 100 in the US and UK Kindle stores, with over 5000 downloads since its release its first month and selling steadily, Mask of the Verdoy, book one of The George Harley Mysteries, is the first in a new series from British author Phil Lecomber. SpiffingCovers has worked closely with him to create the brand and author profile he required to achieve this. Crime thrillers have rarely looked this good. As the self-publishing industry matures, the difference between the quality of its representative output and that of traditional publishing is less obvious and soon will be largely non-existent. Independent authors are a wildly creative crowd and it’s in the self-publishing industry that some of the most inventive and daring writing is happening. In support of this, services for independent authors are required to resemble and exceed the creative output of any large, established publisher; delivering book assets to authors like Phil Lecomber, whose titles demand the best representation, branding and design. So far, our time with Phil has involved gaining a deep insight into his titles and working with him from the very beginning; taking his raw manuscript through editing, proofreading, print layout and eBook development to cover design, creation of an online presence (georgeharley.com), and finally distribution. Each of these services are delivered to the high standard that Spiffing has become renowned for - drawing upon our publishing industry history to give independent authors the ‘big publisher’ experience, without any of the related financial or logistical ties. Phil also takes a hugely active approach to working within his market. Making himself available to connect with his readership on Facebook & Twitter, engaging with forums, leveraging events, exhibitions and any other opportunities to increase exposure. 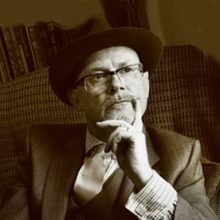 He has also had his book favourably reviewed on various platforms such as Crime Fiction Lover, feeding back into his author profile and driving traffic toward his site and selling platforms. Now that we’ve collaborated with Phil to establish a commercially targeted brand for the vivid universe he has created, we are hard at work on taking the series forward, supplying covers, eBooks and print for the new titles as they are released. There’s lots to be done, and achieving sales figures like Phil’s is a matter of commitment to quality; a top-quality manuscript requires industry-leading assets to support and elevate it to its rightful position. We are incredibly proud to be working with serious, talented independent authors such as Phil Lecomber, and we’re looking forward to more of the same in 2015, which is shaping up to be the year when self-publishing authors show the publishing industry that independent writing talent is alive and well, and looking better than ever.